choking « Howard J. Bennett - Pediatrician and Author in Washington, D.C. In most doctors’ offices, children get blood counts and lead tests at nine months and two years of age. After the finger poke is done, a lab technician will put a bandage on the child’s finger to stop the bleeding. Young children do not like finger pokes. 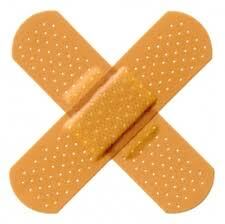 Consequently, they often try to pull the bandage off shortly after it has been applied. What is worse, they typically do this with their teeth and may choke in the process. In my practice, we deal with this safety hazard by telling parents to wait in the office for five minutes (that is when the bleeding stops) and to remove the bandage before they put their child in his car seat.